You have many choices to make about your cancer treatment. One choice you might be thinking about is complementary and alternative medicine (CAM). CAM is the term for medical products and practices that are not part of standard care. Examples of CAM therapies are acupuncture, chiropractic, and herbal medicines. CAM treatments do not work for everyone. 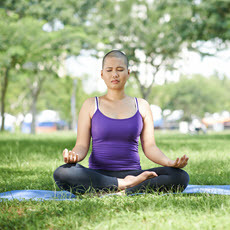 Some methods, such as acupuncture, might help with nausea, pain and other side effects of cancer treatment. Talk to your doctor to make sure that all aspects of your cancer care work together.